The UserDefaults object, formerly known as NSUserDefaults, is exceptionally useful for storing small pieces of data in your app. You use it to save your app user’s settings, set some “flags”, or simply use it as a tiny data store. So what are these UserDefaults? The user defaults is a .plist file in your app’s package and you can use it to set and get simple pieces of data. It’s structure is very similar to that of a dictionary and the user defaults are often regarded as a key-value store. Quick Note: Before Swift 3, the UserDefaults class was known as NSUserDefaults. Swift 3 removed many of these “NS” prefixes. Quite simple, right? User defaults with the UserDefault class is not much different. The dictionary structure is still clearly visible: you see keys on the left, and values on the right. The most common .plist file in any app is of course the Info.plist, that contains many basic settings of your app, like it’s name and Bundle ID. In the next chapters you’ll check out all of these functions. Let’s continue! 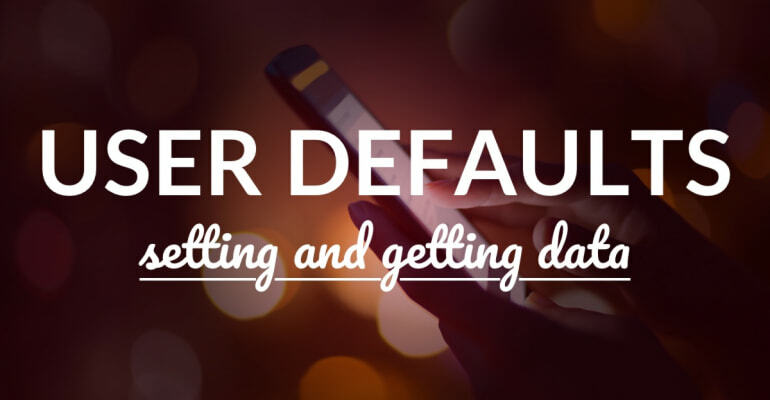 Note: Why are they called “user defaults”? Although it’s not official, I’ve always regarded the user defaults as “the default settings, configurations and data an app user starts the app with”. It’s kind of a little set of data that’s available right from the start of the app, that you use to store simple and general config info. Internally the UserDefaults class can only store NSData, NSString, NSNumber, NSDate, NSArray and NSDictionary classes. These are object types that can be saved in a property list. You can also tell by the “NS” prefix that they are part of the Objective-C framework Foundation. In the example above, you use the class variable standard, which is available anywhere in your code, to get hold of the “standard user defaults”. You can also create your own user defaults, called a persistent domain, which you can read more about in the documentation. As you’ve seen in the official documentation, that set(_:forKey:) takes a number of types as its first argument, as long as they can be saved in a property list file. The user defaults are cached in the iPhone’s memory and they remain there when your app is running. The user defaults are automatically persisted to the disk (asynchronously), so it’s not necessary to manually save or synchronize the user defaults. It’s worth noting here that these getters will return optional values, so the type of name is String?. When the "name" key doesn’t exist, the above code returns nil. let name = NSUserDefaults.standard.string(forKey: "name") ?? "Unknown user"
let name        = defaults.string(forKey: "name") ?? "Unknown user"
let occupation  = defaults.string(forKey: "occupation") ?? "Unknown"
You may have noticed that the functions you use to get values from the user defaults can return values with an explicit type. The one function that can return values for any type is object(forKey:), which will return values with the type Any?. These functions are url(forKey:), array(forKey:), dictionary(forKey:), string(forKey:), stringArray(forKey:) (with type [String]? ), data(forKey:), bool(forKey:), integer(forKey:), float(forKey:), and double(forKey:). Logically, when you’re retrieving a value as Int, but it’s stored as a String, the returned value is nil. So… when do you actually need to use the user defaults? The user defaults are best used for simple pieces of data. If you need to store multiple objects of the same type it’s smarter to use an actual database, like Realm. Database design is an important aspect of the architecture of your app. It’s important to always check whether a data point can, or should be, saved somewhere else. Many back-end frameworks, for instance, already have storage in place to save a current user’s information. The app’s language is saved in the iPhone’s locale settings. If the user already has completed the app’s onboarding, with "hasOnboarded"
If the user has already upgraded the in-app database, with "databaseUpgraded"
If the user is one of your app’s initial beta testers, and should get an upgrade for free, with "isBetaTester_2013"
It’s always important to think through the possible scenarios when working with flags, because it’s easy to make mistakes. One way of keeping track is to create a simple flow diagram showing the different flags, states and defaults you’re using in your app. You can then easily spot if your app can get to an unsupported state, and then change your code accordingly. So, that’s all there is to setting and getting data with UserDefaults! It’s a small, neat data store you can use to save simple settings. Always investigate what database to use for your specific use case. Do you have questions about UserDefaults? Let me know in the comments, below!